Time for Mens Wear to Break Out! 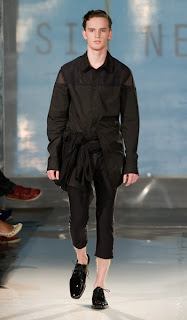 There is little doubt in my mind that Canadian designers will have a huge influence on the mens wear market in the near future. Four have stepped into the arena that I know of and there is at least one more who is hoping to release a line in the near future. While each bring something new to the table, they all have a unique point of view for men and I can only say it's about time. Blake Hyland is a an Australian transplant who now calls Vancouver home. He recently graduated from the fashion design program at the Vancouver Community College and his jaw-dropping grad collection not only stunned the audience but earned him the award for Outstanding Merit in Design. I was privileged to again see his collection last night at Vancouver Fashion Week and it received the same response. What is always interesting to me is the very sweet nature of this talented young designer juxtaposed against the powerful and hard edged fashion he creates. The garments and accessories are created from recycled goods of all genre - leather to fabric. To quote from a recent article in Vancouver Fashion eZine, "One man's junk is this visionary's gold. He finds beauty in the raw, damaged and abandoned and then resurrects the garments with his unique style and flare." To read more go to http://vancouverfashionezine.com/magazineissue32/fashionschool.html and to visit his website go to /www.blake-hyland.com. Sid Neigum is a rising star I had not seen before. 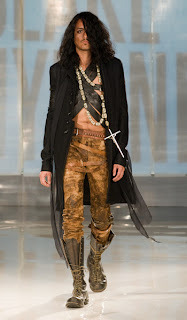 The collection he presented at VFW was beautifully constructed and showcased both mens and womens fashions. This designer is a born and bred Albertan who began to get attention after his move to Edmonton in 2008. 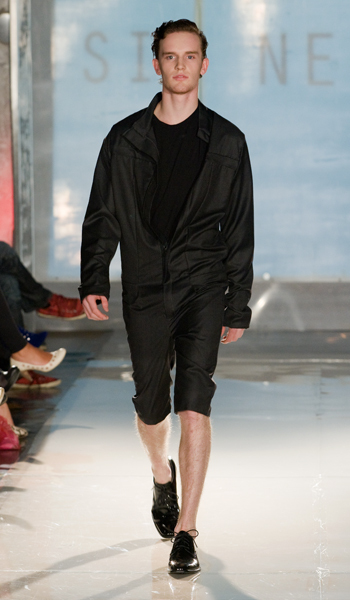 Included in his list of accomplishments are winning the Emerging Designer Award in Spring 2010 at Edmonton Fashion Week, interning under designer Yigal Azrouel and being accepted in to NYC's Fashion Institute of Technology. For mens wear he definitely brought some new elements. Included were knit drop crotch capris paired with tailored blazers and a one piece woven outfit in black that from a distance could have been a coat and capri pants, but up close had the look of a work jumpsuit constructed in beautiful fabric. 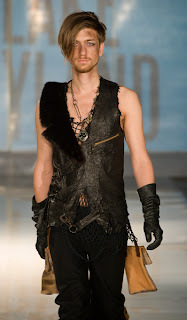 He also had a textured leather vest with offset zipper front that was definitely unisex in its appeal. Overall, the collection was superb. For more on Neigum, go to www.sidneigum.com. Although it's been awhile, Carlie Wong still is recognized by many as a Project Runway celeb. She has long since moved on, but the media exposure was great for increasing her visibility. In Fall 2010, she launched her first collection that included mens wear and it was a welcome addition for men looking to wear something new and innovative. From her recent article in VFE - "When approaching men's wear, she designed fashion forward clothing she wanted to see them in. " The collection, largely in black, includes lots of form enhancing pieces as well as sequins. It's great to see a female designer present pieces she would like to see men in and it's no surprise that this view is a wide variation from social norms. Men, it's time to step up to the plate and be more daring. You will find Wong's website at www.carliewong.com. To read previous articles in VFE on Wong go to - March 2009 http://vancouverfashionezine.com/magazineissue18/fashiondesigner.html and July 2010 http://vancouverfashionezine.com/magazineissue31/fashionupdate.html. As for who might step into the arena soon, reknown Vancouver designer Jason Matlo (www.jasonmatlo.com) confirms mens wear is on his list of must-do's in the near future. I can't wait to see what this talented artist will bring to the table with his unique vision. The future of mens wear is definitely bright. The only question is how long will it take men to step out the cultural restrictions that have held them back.